Here's another, longer route in Rome that goes through more of the ancient city's greener, quieter areas (see route description for Villa Borghese Gardens). 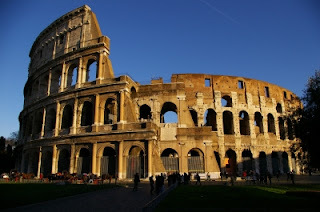 These are located on the south side, and go past a lot more of the ancient ruins: The Domus Aurea, the Colosseum, the city walls, the Baths of Caracalla, the Circus Maximus, the Tiber River and the edge of the Forum. This is definitely more of a tourist run, but avoids the traffic and concrete of many areas. It includes several hills and goes for almost 11 km. You could cut off the Via Latina loop to make it shorter, if desired. 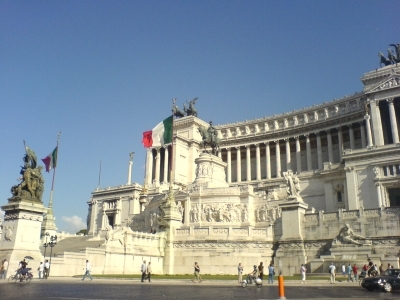 Like the Villa Borghese route, this one will start near the Termini train station, but a bit southwest of it, at the tree-filled Piazza Vittorio Emanuele. There is also a Metro station in the plaza. The piazza itself is worth looking at before you get started. It's dominated by a huge ruined monument, the Trofei de Mario fountains, although you'll find it hard to believe that it was once spouting water. And at its base is the Porta Alchemica, once believed to be a magic doorway into another dimension (Can someone please play the "Twilight Zone" music here?). Let's start running westwards from the piazza, on Via dello Statuto. In just a block, at the triangular plaza, turn left on Viale del Monte Oppio, where we will run straight towards the Parco die Traiano parkland on the Esquiline Hill. This area is covered with ruins and great views towards the south and west. 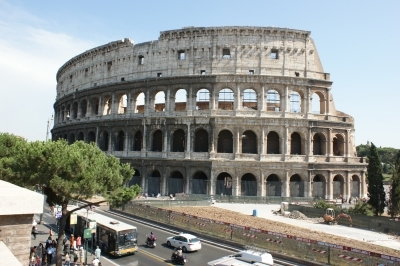 In ancient Rome, it was a fashionable neighborhood until the fire in the year 64 AD. Then Emperor Nero built a huge, opulent new party villa there, the Domus Aurea (golden house). It had 300 rooms but no bedrooms or toilets, but had huge gardens and a man-made lake, and a ceiling rotated by slaves. The villa was an embarrassment to later emperors, and they removed the furnishings and filled it in with dirt. 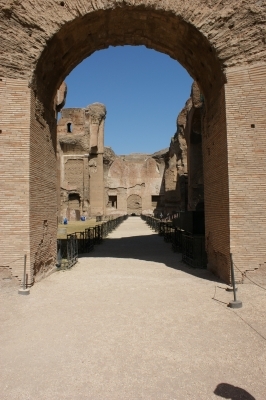 Later, Trajan built a public baths on the site, whose ruins can also be seen. After you enter the park gate, take the first footpath that turns diagonally to the left. You will run straight towards the Domus Aurea ruins, in just 100 meters. Keep running the same south-west direction past more ruins, going downhill towards the Coloseum, which you'll see in the valley straight ahead. You come out of the park at the Piazza del Colosseo. Run across the street to get a closer look at this amazing antique wonder. Just for fun, lets do a lap around the Colosseum: turn to the right, with the building on your left and run around to the backside, where you'll see Constantine's Arch. Keep going around the Colosseum, with the tree-crowned Nifeo Park on the right. Now turn right on the Via Claudia, and the Nifeo Park on your right. Keep going straight for a kilometer, until you come to the big intersection at Via Druso. NOTE: It's possible to run through Nifeo Park, but the ways are so impossible to describe, that I'll avoid it here. But if you feel like discovering it, give it a try! Turn right on Druso, and run for 250 meters until you come to another big intersection just before the gigantic Caracalla Baths ruins straight ahead. We'll see those ruins soon, but first turn left on Via di Porta San Sebastiano. The road splits in just 100 meters: take the left-hand side, because there is little traffic on that road, the Via di Porta Latina. Both streets head south to the gates in the old city walls, going past walled-in gardens of wealthy villas. Some of the walls you can see over, and some you can't. The Via di Porta Latina is just half a kilometer long, and goes past an ancient round gatehouse and then the gate through the old Aurelian city walls. Just outside the gate, turn right and run down Viale delle Mura Latine, following the city walls. You'll soon come to the imposing San Sebastiano gate, which empties out into the famous Apian Way to the left. You could follow it for a while if you felt like doing some extra distance, and it goes through more green landscapes. We'll keep going straight, with the walls still on our right side. In a few hundred meters the Via Cristoforo Colombo breaches the walls, and we'll turn right here and run back into the city. But after just a few meters, cross the stret and take the small street leading diagonally to the left, the Viale Guido Baccelli, going straight towards the Caracalla Baths. The street runs along the back side of the ruins. The road turns a corner to the right to go along the north side of the baths. Keep running straight along the north side on the Via Antonina, with an athletic field on your left side. You come out onto the Viale delle Terme di Caracalla, a modern, tree-lined parkway. Turn left here and run straight across the next intersection at Viale Aventino, and you'll find yourself in the Circus Maximus, the ex-chariot-racetrack, now a big open lawn. You can run straight through the long field, which once had a stadium that could hold 250,000 spectators. The ruins on the hill to the right, the Palatine Hill, were once the Emperors' palaces. 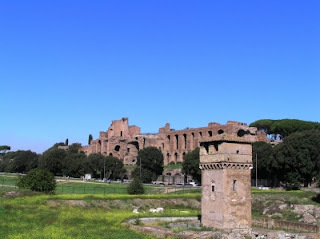 At the far end of the Circus Maximus, keep to the left and run out the Via della Greca the one block to the Tiber River. On your right, you'll pass a church with a real curiosity under its front porch: the Bocca della Verita (mouth of truth), a strange marble disk that nobody quite knows where it came from, but apparently spews out wisdom (Do I hear the Twilight Zone theme again?). At the river, turn right and then immediately cross the Ponte Palatino bridge on your left, then keep going along the water to the next bridge, with the river to your right. 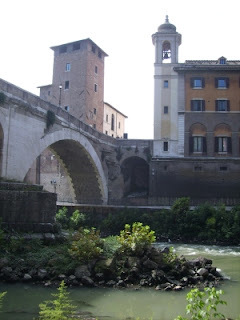 You'll see the Tiber island in the river. After just 100 meters, turn right at the next bridge going to the island. The island is occupied by a monastery-run hospital. Keep running straight over the next bridge (each of the island's bridges is 2000 years old! ), and you are back on the original side of the Tiber. Here, you keep going straight, with your back to the river, up the Via del Portico d'Ottavia. You'll soon see the portico itself straight ahead: a temple ruins, excavated to expose recent finds. There are pedestrian footpaths built into the ruins to the right. Take them as they lead eastward to the Via del Foro Piscario. This itself goes by some fascinating ruins: houses built into the ruins of another old amphitheater on the right side. You will come out on the Via del Teatro del Marcello, where you turn left and run up past the Capitoline Hill on your right side. If you feel up to it, you can take a side trip up the hill to the museum. It's open courtyard is full of monumental relics found in the area. The Via del Teatro del Marcello runs up to the base of the over-sized white Vittorio Emanuele Monument (I once thought that this was the city hall building). 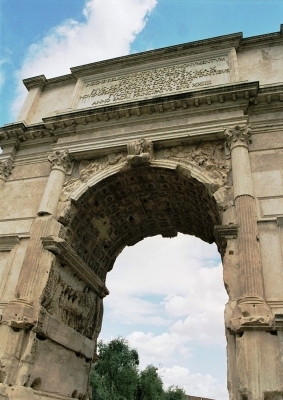 Circle around the front of the monument and continue running down the Via dei Fori Imperiali, with the Forum ruins on your right, running straight back towards the Colosseum. Run past the Colosseum, then turn left to go up through the park on the Esquiline Hill and return to the Piazza Vittorio Emanuele the same way you came.